Amish Friendship Bread is one of those go to comfort foods that we all need to have in our recipe box. Over the years we have taken the basic Amish Friendship Bread Starter (click the link to get the starter recipe) and created a lot of fun bread, cookie and other recipe variations. One of our family favorites ways to use the starter is with cookies. It is amazing how yummy these cookies turn out. These are great to use with your leftover Halloween candy, too! Are you familiar with Amish Friendship Bread? What is your favorite recipe? Optional Ingredients - use whatever spices and adds in that you want in your cookies. Follow the amounts below but use your own favorites! 1-Preheat oven to 350° F (176° C). 2-Cream butter, shortening, eggs and sugars. 3-Stir in rest of ingredients. 4-Drop double tablespoon size dough onto ungreased baking sheet. Makes 50 large cookies or 75-100 small cookies. This recipe goes well with up to two cups of any variety of nuts and chips. The ingredients above does list a few of our family favorites. Substitute the spices for some of your favorites. 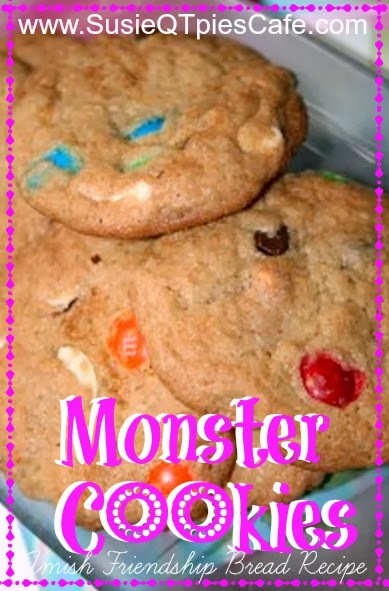 Use a small cookie scoop for bite size cookies or two scoops for these larger, monster-sized cookie.